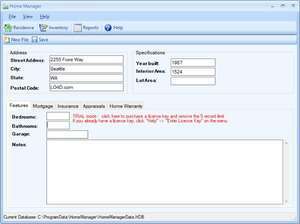 Home Manager 2008 provides features for tracking detailed information including home inventory, asset values, warranty information, repair and maintenance history, and an unlimited number of digital images for each item. This information can be quickly accessed using the built-in search feature. For added security, an inventory report, complete with serial numbers and pictures, can be printed for off-site storage. Home Manager 3.0.3021 is a shareware program and can be used as a demo to try the software until the free trial period has ended. A full version of the program is available after the trial period ends. For security reasons, you should also check out the Home Manager download at LO4D.com which includes virus and malware tests. Additional screenshots of this application download may be available, too. Home Manager 2008 has a presence on social networks.